In Delft Tiles tapestry we see the work of artist Raymond Campbell. 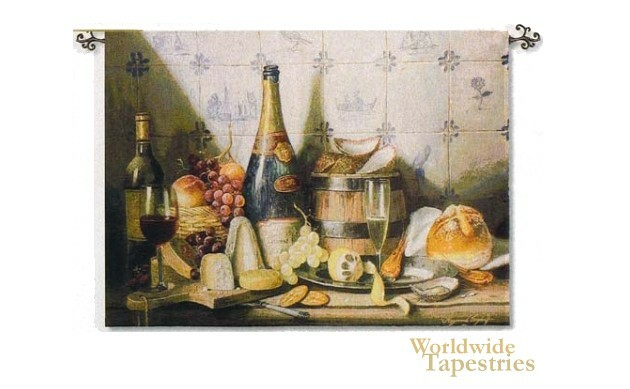 In this work by Campbell, artist from England whose works show in the UK and in New York, we see a still life of wines, cheeses, fruits and bread. We see the items displayed on the tray and on the bench top with blue tiles. The art of Campbell is influenced by old Dutch masters. The Delft Tiles tapestry is backed with a lining and a tunnel for easy hanging. Note: tapestry rods and tassels, where pictured, are not included in the price.